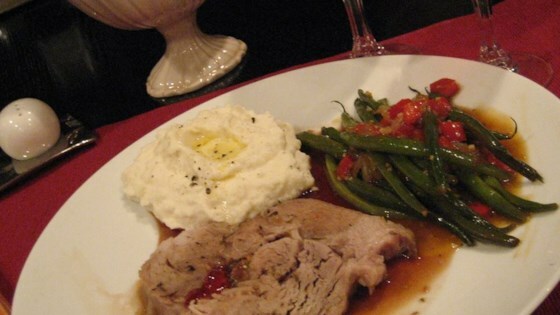 "Flavorful boneless pork loin with a classical marinade. The currant sauce is a must for an elegant touch. Makes a great holiday or special occasion dinner." Place roast in re-sealable plastic bag. In a medium mixing bowl, combine 1/2 cup soy sauce, 1/2 cup sherry, garlic, mustard, ginger and thyme. Pour marinade in bag, and seal. Place the bag in a large bowl, and refrigerate for at least 3 hours. Place roast in a medium roasting pan. Roast the pork with marinade uncovered at in preheated oven for 2 1/2 to 3 hours, or until internal temperature reaches 170 degrees F on a meat thermometer . Baste hourly during cooking. Serve with currant sauce. To make currant sauce: In a small saucepan over medium-low heat, slowly melt the currant jelly. Stir in the 2 tablespoons sherry and 1 tablespoon soy sauce. Tender roasted pork shoulder with a sensational port and blueberry sauce.